Obon Festival, Tokyo, 2011. Photo by bhollar via Flickr. Obon is a Japanese holiday to honor deceased ancestors, much like the European Halloween or the Latin American Día de los Muertos. 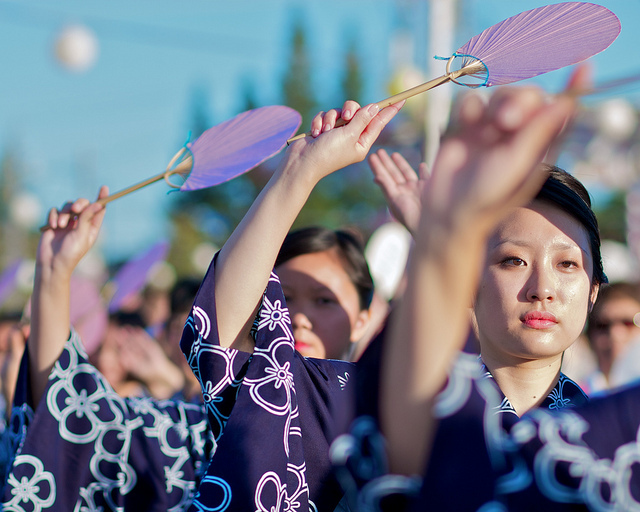 Rooted in Buddhist traditions, Obon ensures that we express gratitude for the hard work of the generations before us. The Ullambana Sutra, a Buddhist text, tells the story of a monk named Mokuren who was initially unable to help his suffering mother’s spirit pass on. In response, the Buddha created a ritual and offering for the living to assist their ancestors’ souls and bless relatives who are still living. These practices became the basis for the modern-day Obon festival. Obon festivals are held in July and August, in Japan and Japanese immigrant communities throughout the world. The original sutra appointed the fifteenth day of the seventh month as the holiday, but there are variations in date because of differences between the Gregorian and lunar calendars. The festivals feature food, music, and most importantly, dancing! Bon Odori, San Jose Obon Festival, 2012. Photo by –Mark– via Flickr. When Mokuren’s mother’s soul found peace, it is said that he reacted by dancing. Obon dancing, or bon odori, is an important part of Obon festivals throughout Japan, with certain regions even having their own unique dances. Dances have been also developed abroad by Japanese emigrants living in countries such as America or Brazil. 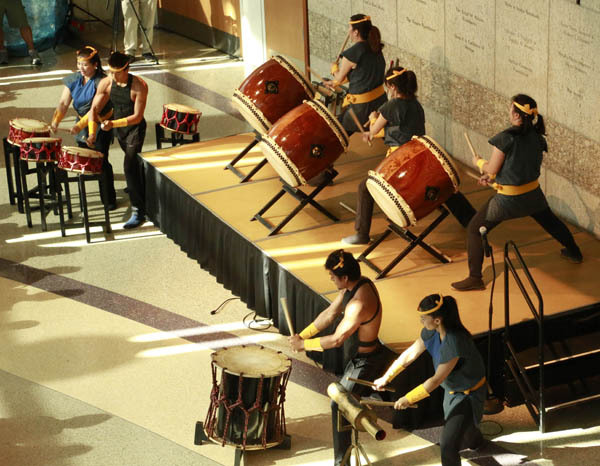 Live music, including taiko drumming, typically accompanies the dancing. In Japan, some families return to their parents’ homes to celebrate Obon. These celebrations often include cleaning up family gravesites and offering food to ancestors. Another custom involves floating lanterns down a river in hopes that the lights will help guide souls that remain on this earthly plane. 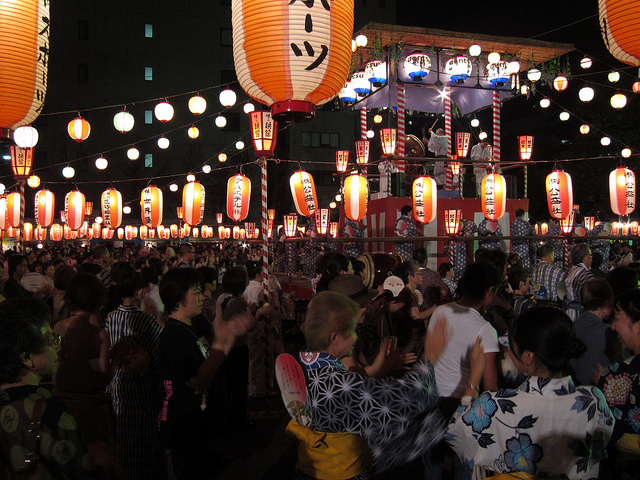 Even though Obon is based on Buddhist beliefs, no one is excluded from celebrating. Obon festivals are important community events, and celebrating the departed doesn’t require any special religious belief. The Obon dances and food here in America may be different from those in Japan, but all the festivals maintain the same reverence for family and community. 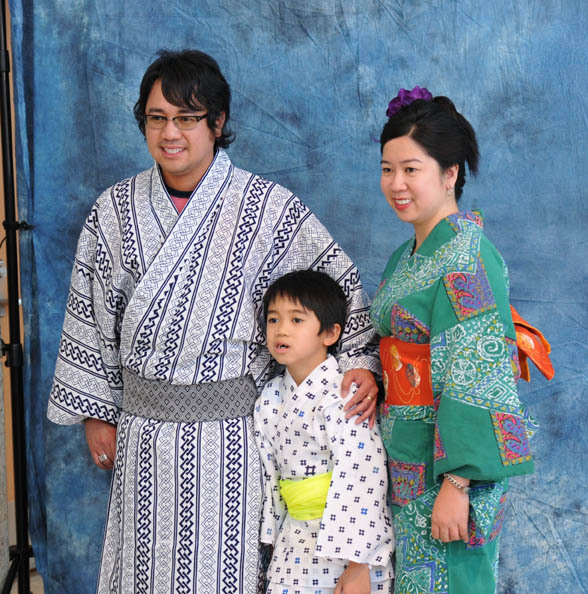 Visitors get in the Obon spirit with a communal bon odori dance at JANM’s 2013 Natsumatsuri Family Festival. Photo by Russell Kitagawa. 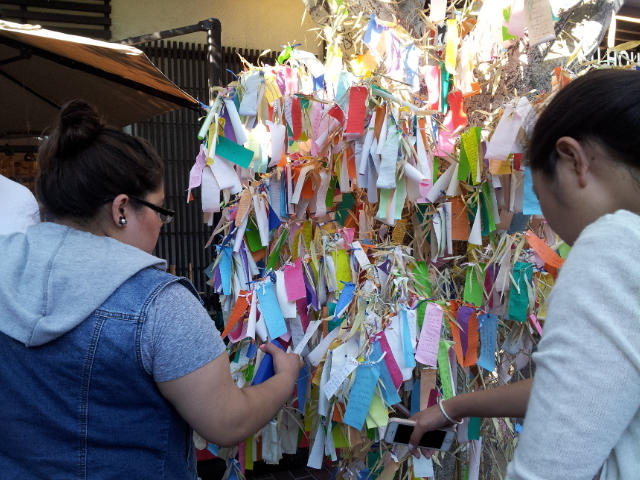 JANM’s Natsumatsuri Family Festival on August 9, 2014 will feature a lecture on Obon traditions by Rimban Bill Briones of Los Angeles Hompa Hongwanji Buddhist Temple and a participatory bon odori dance. Come learn more about Obon and celebrate your ancestors! This post was written by Mitchell Lee, one of JANM’s 2014 summer program interns. Mitchell is a student at UCLA, where he is majoring in Japanese and Asian American Studies.